The Book of Genesis chronicles the lives of Adam and his descendants, beginning with the creation of Adam in chapter 2 and ending with the death of Joseph in the book’s final chapter. For the particular genealogical line ending with Joseph we are told the lifespan of each male, which usually includes their age at the birth of their first son and either the years they lived afterwards or their total lifespan. Consequently, an unbroken genealogical record exists stretching from Adam to Joseph. The genealogical line includes Noah, who survived the Flood by building an ark on the instructions of God, Abraham, the first of the three Patriarchs, who led his people to the land of Canaan on the instructions of God, and Joseph, the dreamer, who was sent to Egypt by his brothers, became a powerful man there and later called his family down from Canaan to save them from the seven-year famine. One great theme runs through the lives of these three men: they lead God’s people through an important transitional period in their history. For Noah it was survival of the Flood, for Abraham emigration to a new land and for Joseph escape from a great famine. These facts have some bearing on what is to follow. Having dug out encoded numbers from biblical lists in Numbers, Ezra/Nehemiah and other books, I have long suspected that the genealogical list in Genesis could also be profitably mined. Initially I concentrated on Genesis 5 and 11, where most of the lifespans were found, finding tantalising but incomplete glimpses of a hidden code. However, I was unaware that this genealogical list actually threaded its way through the rest of Genesis. On discovering the rest of the list I was quickly able to find the treasure within. The genealogical list from Adam to Joseph is tabulated below. Each row represents the biblical location of each piece of genealogical information, this location given in the left-hand column. The second column from the left shows the place value of selected verses - only those of interest here are shown. The next column gives the names of each male in the generational line from Adam to Joseph, the three columns after it (A, B and C) showing the details of their lifespans - this three-column layout is based on the biblical format. The right-hand column shows the running totals of all the numbers in the three columns, with the numbers of interst emboldened. Eight notable features of this list are discussed below. Note that there are other points of interest, but their discussion would obscure the more important features I want to communicate. 1. Genesis 9:28 states that this is the years Noah lived after the flood, rather than after the birth of his first son. This is the only time that the father’s age when his oldest son is born is not directly stated. 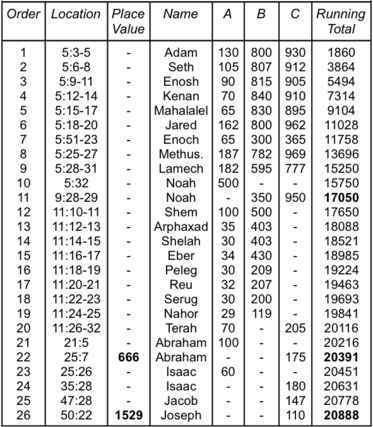 I have added the number written in the Bible rather than calculating Noah’s age at his son’s birth, as past experience has shown me that the biblical number is always the one to be used. 2. There is a confluence of elevens at row 11. The running total is 17050, which is 11 x 1550. In addition, the subtotals B and (consequently) A + C are themselves multiples of 11. 17050 is also a double multiple of 5. Note that the chapter here is 9, also suggesting 9/11. As shown elsewhere on this site, the numbers 11 and 5 are the key numbers for unlocking the meaning behind the 9/11 event. In this respect it is interesting to note that most of the lifespans are recorded in chapters 5 and 11. The chapter 5 total is 15750, a triple multiple of 5. The total for chapter 11 is 3066, or 511 x 6. 3. The sum of the ordinal values of the names to row 22, as laid out, is 1111 (11 x 101). Like row 11, row 22 seems to be suggesting 9/11 to us. If this encoding is genuine then the digit 2 in the number 20391 must also refer to the Second Coming. 5. Row 22 also corresponds to Genesis 25:7, the Bible’s 666th verse. As I have shown, 666 is encoded into 9/11. It's primary meaning, however, is given below. Again, the 2 in 20888 must point to the Second Coming. Completing the confluence of elevens found in the list, 1529 is also a multiple of 11. In addition, the highest prime factor of 20888 is a number surely confirming that this is no random collection of lifespans but one that was carefully designed to reveal the Word of God to us. 8. There is a correspondance between the encoded numbers and the narrative within Genesis, through the three focal points of these encodings, rows 11, 22 and 26. In row 11 we find Noah, who built the ark that preserved a remnant of God’s people and earth’s flora and fauna. In row 22 we find Abraham, the first of the three Patriarchs, who led his people to Canaan. In row 26 we find Joseph, who called his family down to Egypt and saved them from the famine. These people created the definitive events in the Genesis narrative. a) Their sum is 1279, the number of units in the third generation of The Creation Snowflake. 373 is the number of units in the second generation of this figure. b) They feature in the multilayered encodings revealed in In The Beginning and The Signature Of Christ. c) They form a cross embedded into the chapters of the Bible, as described in the Day of the Lord. This marks the site of a major 9/11 prophecy. The confluence of names associated with the transitional periods in Genesis, significant chapter place values and encoded numbers surely makes the authenticity of these encodings beyond reasonable doubt. They also reveal the significance of the Second Coming itself, as another great period of transition, which this time will be the salvation of not just a few middle eastern tribes, but of all of God’s people. 1. 888 is also the standard value of ‘The New Bible Code’. This was assuredly not by my own design!